As this week nearly draws to a close, we want to thank you for joining us on #ThatBusinessShow every weekday at 8am on #1250WHNZ and on http://www.tampabayradio.com! Here on the show, we strive to bring our listeners people with great stories, businesses, ideas, and talents every weekday on the #MorningAir! If you missed today’s show, then head to http://www.tampabayradio.com to listen to any of our episodes on demand! On the show this morning was Expert Contributor, Malcolm Tennant, Co Founder of Access Reverse Mortgage. 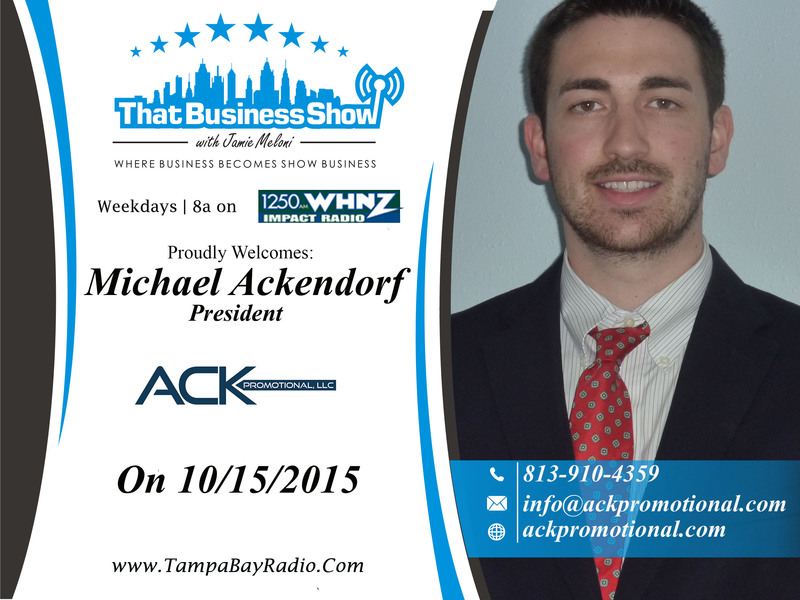 We also had Michael Ackendorf on our second segment, who is the President of ACK PROMOTIONAL. We had a great discussion with our guests, Malcolm gave us some valuable insight on the process of a reverse mortgage, and Michael told us what sets ACK PROMOTIONAL apart from the conventional advertising specialists. If you missed out on the #MorningAir discussion, then head to http://www.tampabayradio.com or Jamie’s YouTube channel at http://www.youtube.com/jamiemeloni! Our first guest on #ThatBusinessShow was Malcolm Tennant, Co Founder and Specialist with Access Reverse Mortgage. He has overseen the funding of more than 1,000 reverse mortgages, and knows the functions inside and out of a reverse mortgage and what it can do to help someone along with a retirement plan. The whole concept of a reverse mortgage is usually misunderstood, and Malcolm wishes to extend the invitation to anyone with questions on the process and benefits of a reverse mortgage to contact him at http://www.accessreversemortgage.com. Malcolm also told us about a little known fact, you can actually buy a home using a reverse mortgage to double your buying power! We had a wonderful time with Malcolm on the show today, and if you missed out, make sure to head to http://www.tampabayradio.com to join the #MorningDiscussion! 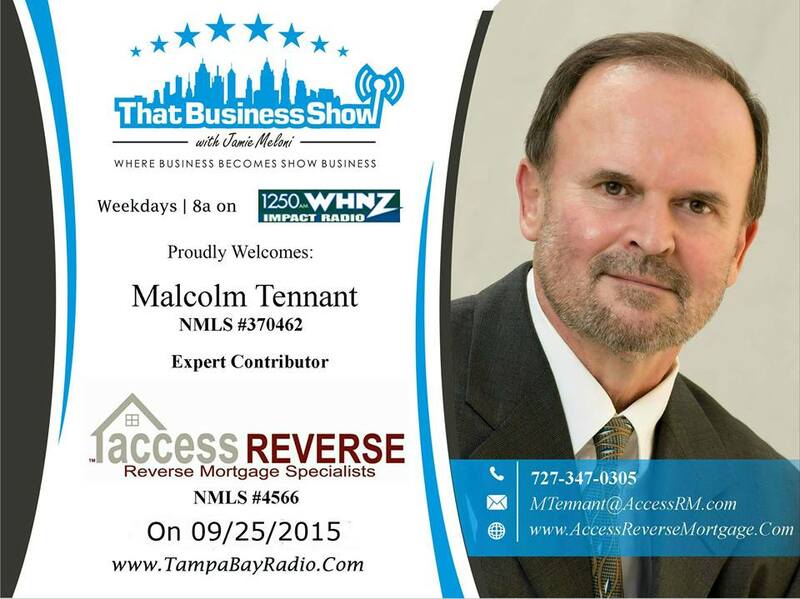 We look forward to having our Expert Contributor and COO of Access Reverse Mortgage, Malcolm Tennant again on #ThatBusinessShow with our Host, Jamie Meloni! Our second and last guest here on #ThatBusinessShow with Jamie Meloni was Michael Ackendorf, President of ACK PROMOTIONAL, specialists on advertising your small business and branding your name! ACK PROMOTIONAL, LLC is an advertising specialties company whose mission is to cost effectively provide small business owners quality promotional products & services in an easy and customer-friendly way. Focusing on small businesses and non profits allows Michael to really connect with his client, and allows him to build a marketing plan that suits the client and is the most cost effective. With larger companies, you just don’t get that level of communication and consideration that a local firm can provide you with. So please consider ACK PROMOTIONAL for all of you advertising and marketing needs! Learn more about Michael Ackendorf and ACK PROMOTIONAL at www.ackpromotional.com! This entry was posted in Articles, Entrepreneurship and Business and tagged business, radio, show business, talk. Bookmark the permalink.